I first wanted to thank ShabbyApple.com for partnering with me on another giveaway. I also want to thank all of you that entered! I wish I could give each of you this gorgeous dress but sadly I can't. 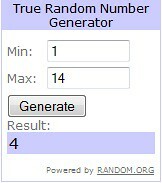 Which means I have to select a winner. The winner is Julie! Congratulations Julie! I'll be emailing you very shortly. Again, thank you to all who entered and thanks to Shabby Apple!